Recently, I've seen a couple posts about intuitive eating by dietitians making comments implying that intuitive eating isn't for everyone, namely those who suffer from nutrition related chronic illnesses. They claim that while intuitive eating is useful for general health and eating disorder recovery, people who are sick need a more restrictive or rigid approach to nutrition. This is frustrating to me, because a.) people with nutrition related chronic illnesses can have disordered eating (or develop it in response to a restrictive medical nutrition plan) and b.) it's pretty clear in reading their comments that there is a disconnect or misunderstanding about what intuitive eating is. And while I definitely think there is much more room for nuance when discussing intuitive eating for chronic illness, intuitive eating is for everybody (and every BODY). So if you're someone who is diagnosed with a chronic health condition and not sure if there's room for you at the intuitive eating table, pull up a chair and let me welcome you in! Intuitive eating is more than "all foods fit." Because for some people, all foods don't fit. If you have a severe tree nut allergy, tree nut's don't really fit. If you have celiac disease, gluten doesn't exactly fit. The difference is in intuitive eating we don't label those foods as bad - avoiding them comes from a place of self care, not restriction (my old intern Lauren, who has celiac disease, wrote a really great post on this). While intuitive eating gives unconditional permission to eat all foods, that doesn't mean you have to eat all foods. What I love about intuitive eating is that nutrition is approached with nuance. So for example, if I was working with a client who has diabetes, I wouldn't demonize sugar. But I also wouldn't encourage them to eat it without abandon, as one of the posts I saw implied. I would look at whether this client is eating adequately throughout the day, because nothing fuels a sweet craving like hunger. I would help chip away at the emotional restriction around sugar, because hello forbidden fruit. I would introduce mindful eating strategies. And there may even be situations where a low sugar swap is appropriate - that doesn't necessarily contradict intuitive eating, depending on the intentions behind it. Honoring your body with gentle nutrition is the 10th principle of intuitive eating. It's not 10th because it's least important, but because we really need to make peace with food before incorporating nutrition goals. Otherwise it will trigger the restriction and deprivation that makes us get all kinds of crazy around food - and usually results in eating more of that food you're trying to restrict in the first place. The cool thing about intuitive eating is that YOU get to define what gentle nutrition looks like for you. 2. Being a tourist in your hometown. This past weekend, my husband and I spent Saturday night at Caesars Head, where his best friend's wife's family has a house with probably the prettiest view in all of South Carolina. Every time I go up there, I feel really sad I spent five years at Clemson, which is right down the road, yet rarely went up to the mountains. As much as I love to explore the world, I forgot to explore the area where I was living. These days we try to be a little better about being a tourist in our hometown, but there's still a ton of places in and around Columbia we have yet to explore. Our current goal is to go out to eat on the international corridor more often, and walk the dogs in different historic neighborhoods. I know we're not alone in getting stuck in a hometown rut, so this is my call for you to check out that local park you always drive by, eat in small local restaurant that's off the beaten track, or see what small towns are within a short drive from where you live. 3. Filling your house with meaningful things. This weekend, I also met up with my mom and one of her friends in Charlotte to go to a pottery invitational at the Mint Museum (highly recommend if you're in the area!). She got me a couple beautiful pieces for our home - a jar by Melting Mountain Pottery that was made with this really cool mixed porcelain local to NC, so it has these really pretty orange and blue "imperfections,” and a vase with this gorgeous blue glaze with golden speckles by Susan Filley. If you're into crafts, definitely check out their work! The older I get, the more Marie Kondo I get with my decorating (I haven’t read the book, but from what I understand if it doesn’t bring you joy, get rid of it). So I love to have things that are special and remind me of happy memories, even if it doesn’t match or fit that perfect white everything + marble + brass accents + indoor plants that aren’t half dead vibe that’s so popular right now. When I was cleaning out and reorganizing our house recently, it made me happy to see how many things sparked joy. And pro tip - if you get some cheap white and brass stuff from Target it ties everything together! Have you heard of labyrinth's before? It's basically a maze-like structure that originally comes from Greek mythology. Many churches, parks and hospitals will have these labyrinth’s on their property which you can visit and walk, it’s like a walking meditation. I had never heard of these before, until one of my clients shared how much how much she enjoys them. I love meditation, but I have a hard time sitting down for them, so I’m really excited to try a labyrinth out. She sent me this labyrinth finder in case you're interested in checking one out for yourself. 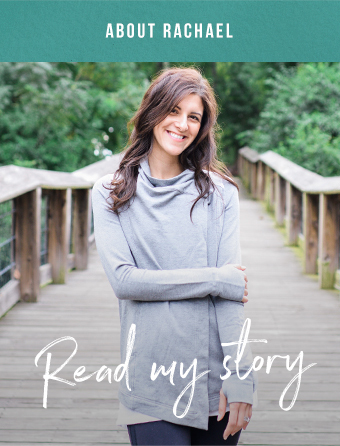 I loved this post by @yourhappyhealthyRD on the brains neuroplasticity, aka it’s ability to change. Old disordered eating and negative body image thoughts can feel so deeply ingrained, partly because they are. Think of these thoughts as a well tread path through the woods. As that trail is walked over again and again, the dirt gets pounded down and it’s pretty easy to travel. Creating new thought pathways is hard at first because you’re basically walking off trail. Metaphorically, you’re clearing through brush and jumping over fallen trees. But the more you go off path (aka actively choose to think new thoughts), the easier it is to travel the new path. Eventually, the old path gets covered up by weeds and bushes and trees, and the new trail becomes the easy path the travel. Any cool things from your week that you’d like to share? Drop a link or a story in the comments!